Our son lost his first tooth recently, and besides finally getting to use his tooth fairy pillow (which was SUPER exciting to begin with! ), he got a couple of brand new coloring books, new crayons, and a little extra cash to throw in his piggy bank. He loved it! After that first one, no gifts…just some coinage or a $1. Whatever your family is comfortable doing will always be appreciated by your little one! One of the hot ticket items that is all the rage right now is the tooth fairy pillow. 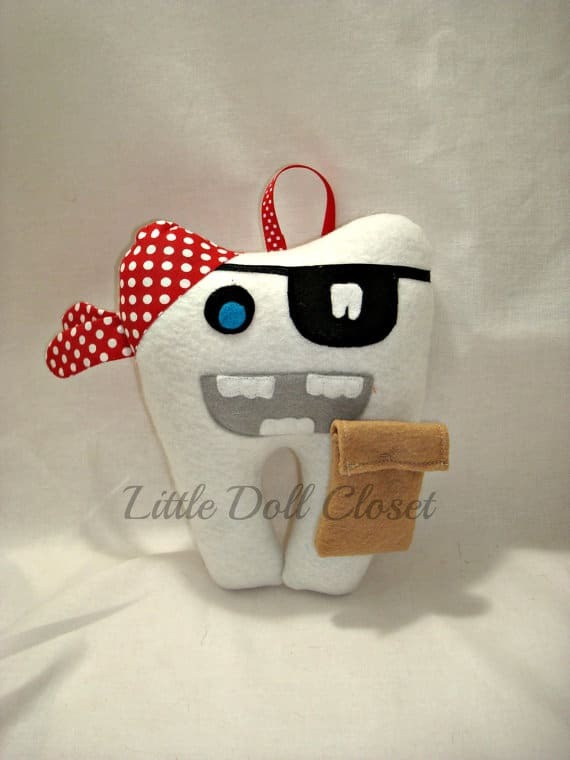 These are pillows that store the precious tooth until the Tooth Fairy arrives! There are a lot of great DIY pillow ideas that are around, but since I’m a bit lacking in the DIY pillow-making forum, I checked out Etsy. 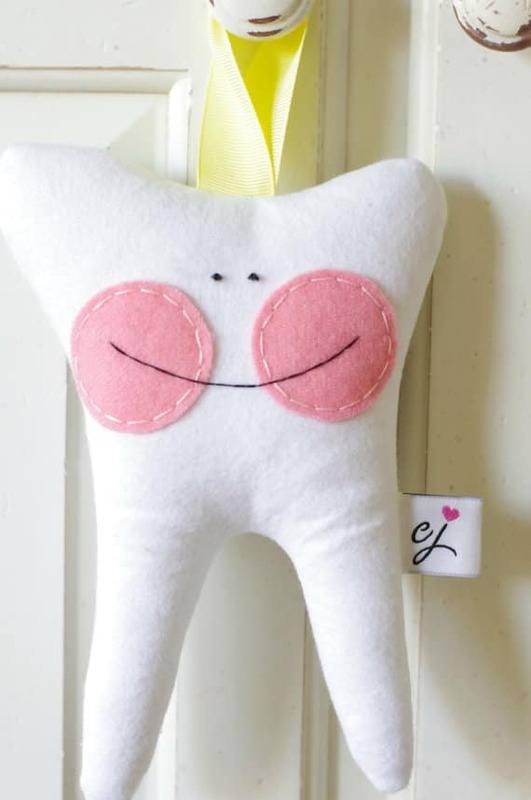 There are so many cute tooth fairy pillow ideas on Etsy! Here is a simple, yet sweet one that you can find at the GoodWeather shop on Etsy.com! A tooth fairy pillow that is shaped like an actual tooth?!?! Say it isn’t so! Check out this pillow at Etsy.com from the ChloeJaneHandmade shop and see it for yourself. OMG! I don’t know about you, but I have a little pirate lover in my house that would be SOOOO excited to use this as his tooth fairy pillow, which is over at the LittleDollCloset shop at Etsy.com! LOVE! 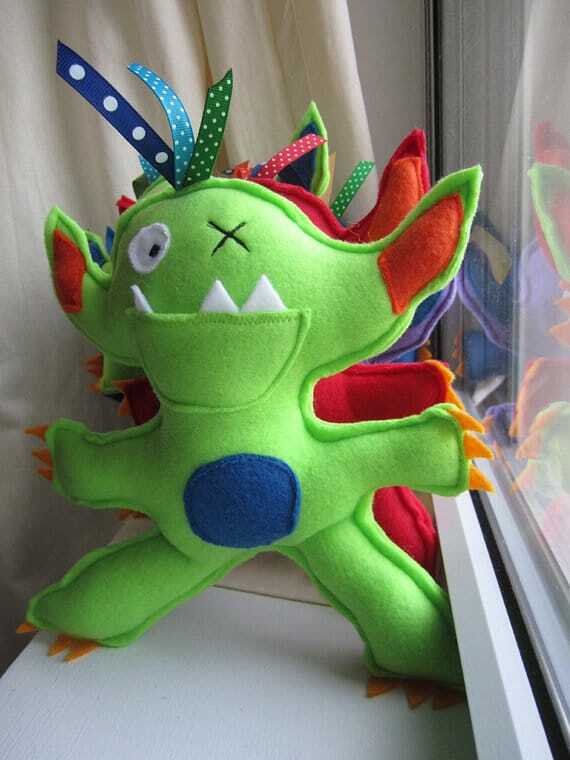 Teeth and money will fit great in this little green monster’s mouth! What a fun tooth fairy pillow! Found at Etsy.com in the Mitzibell shop, there are a whole bunch just like this little guy with different colors and features. Wow! 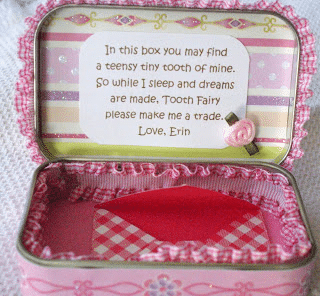 For those of you who want to go the DIY route, but just aren’t comfortable making a tooth fairy pillow, I found this Tooth Fairy DIY Box, which is super awesome! Check out 5kidsmom-margot.blogspot.com for the step-by-step list of how to make this happen! I love that I can make this and customize it ANY way I want for the kiddos! 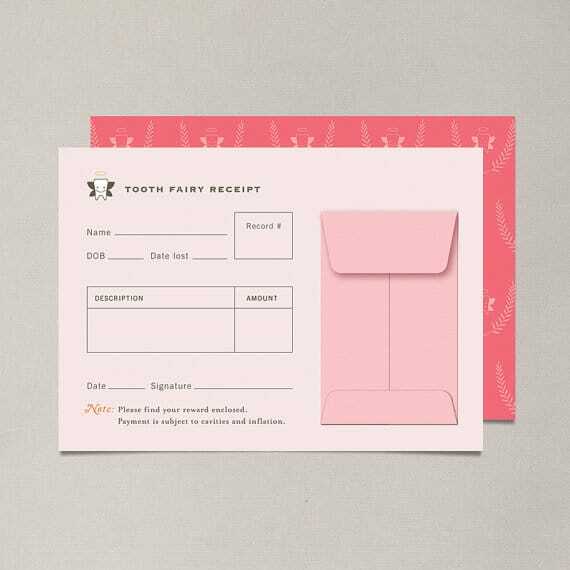 Another tradition that would be great to start is to create a money envelope that the Tooth Fairy will leave behind after swiping that perfect baby tooth! You can get as elaborate as you want and make one yourself, or check out these two ideas I found on Etsy! 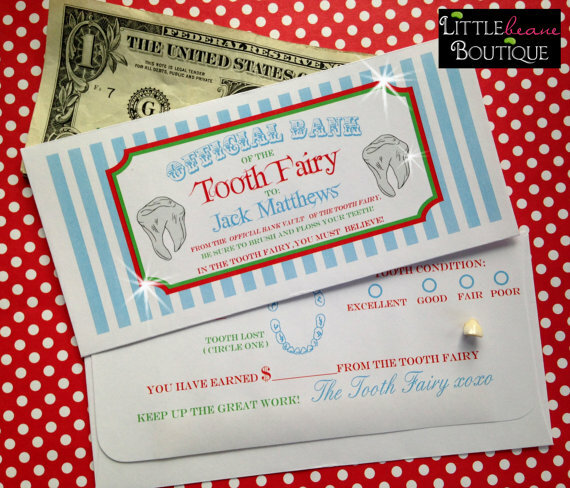 I love this little packet that is the “Official Bank” for the tooth fairy! Simple, yet effective and it can be personalized anyway you want! Check it out over on Etsy.com at the LittlebeaneBoutique shop! 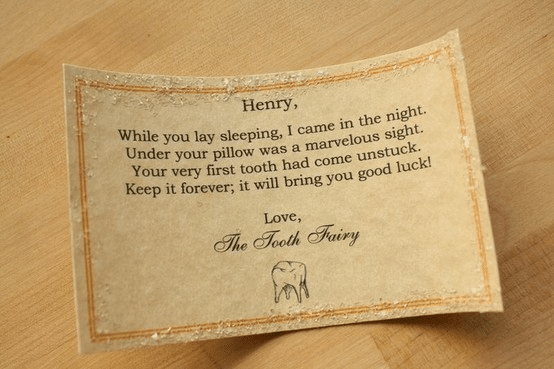 What a fun tooth fairy letter idea! 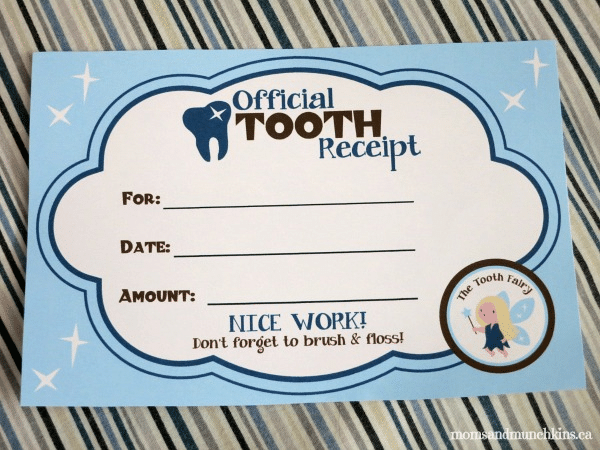 Of course, there are tons of Tooth Fairy Receipt printables that can be had. I love this idea to keep in the baby book, or even to scrapbook the big event! Here are a few that I found that I’m dying to get printed! Who can pass up a free printable?! Awe! 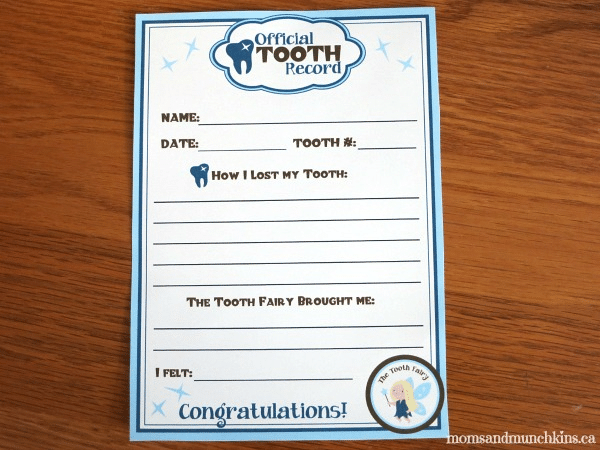 What a great printable to commemorate the very first tooth lost! And it’s from the tooth fairy, herself! Find this at Indulgy.com. When the dentist office is involved, it has to be pretty important, right?!?! 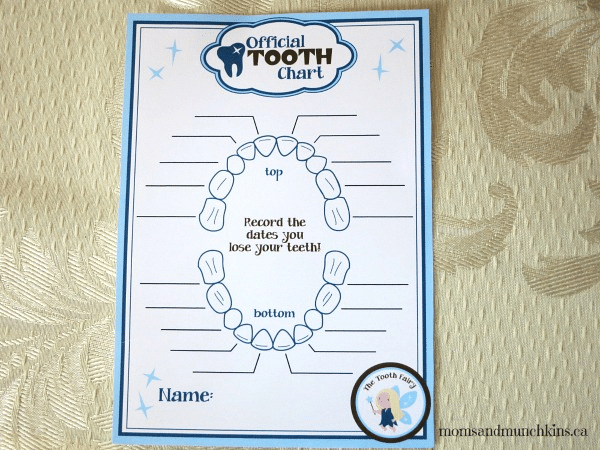 Check out this awesome free printable for the little ones from MadisonFamilyDental.com. Make it official from the experts! Finally, there are just some darn good fun ideas that I came across that really will help to make the experience special and magical for the little ones. From fairy dust, to special tooth fairy doors, you’re going to love all of these little extras that will put huge smiles on the kiddos faces, and may even garner a few ooooh’s and aaaah’s! 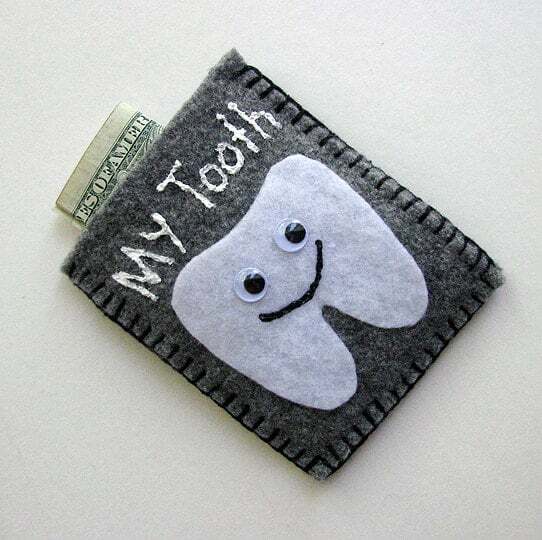 Looking for a super fun DIY project that relates to the Tooth Fairy? 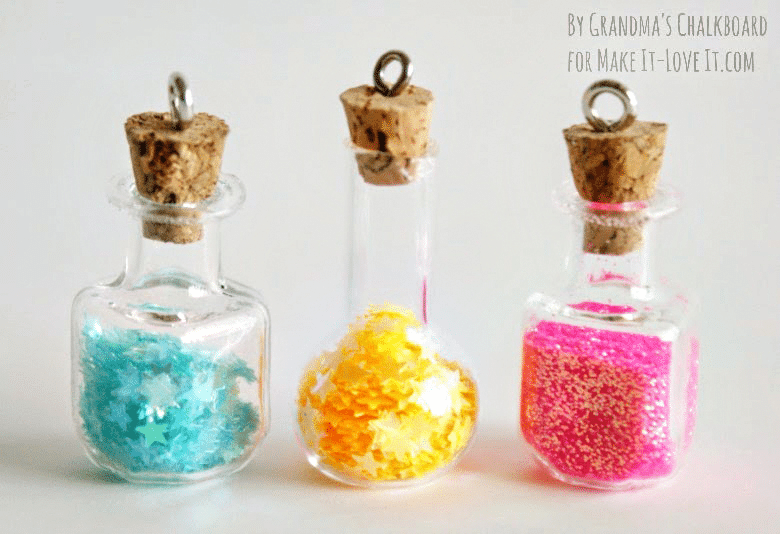 Check out this Fairy Dust from MakeIt-LoveIt.com! This will take you through all the steps and is such a fun little idea! It’s all about the details! It will make that fairy money even more magical! Want to bling out the loot that the Tooth Fairy leaves? 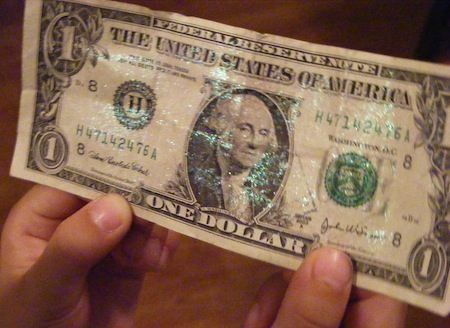 Than glitter money is your answer! ArizonaFoothillsMagazine.com will show you how to do this! Don’t have any glitter in the house at the last minute? Maybe see if you have some glittery nail polish! That would totally do the trick! Another big item that the Tooth Fairy uses these days are Tooth Fairy Doors! Who knew?!?! Check out this unfinished DIY Kit on Etsy.com from the TaDaaStudio Shop. I love this, because you can totally customize it to your little one’s room! Yay! 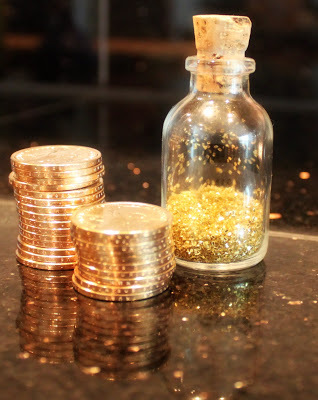 Grab some Dollar coins, some “Fairy Dust”, and the possibilities are endless! I loved reading this article at MooreMinutes.com! How fun! I love this idea! 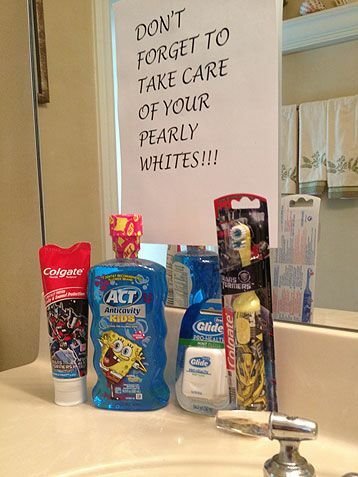 Since it’s all about keeping those pearly whites healthy, stops from the tooth fairy could always use some oral hygiene items! And since my daughter seems to be INFATUATED with her tooth brush, getting a new one might get her so revved up that she won’t be able to contain herself! Check out more ideas at iVillage.com and make sure you have some spares for last minute tooth fairy ideas! Oh my goodness! 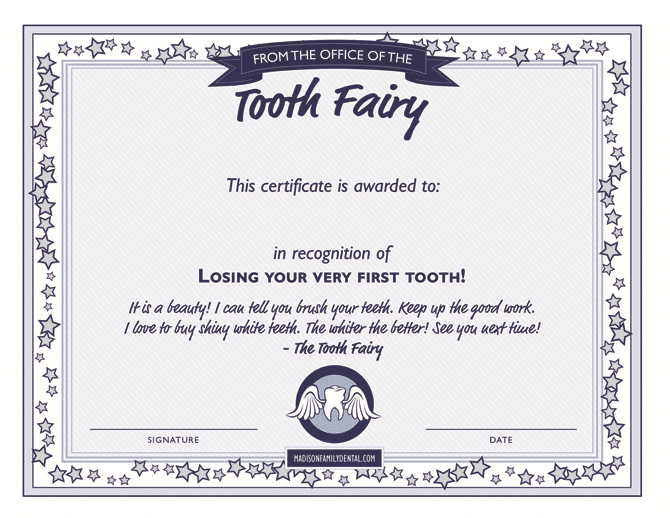 Finally, check out the tooth fairy letter that you can get over at LeafCutterDesigns.com! 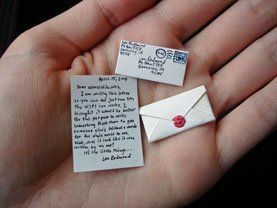 Who knew there were adorable things as such tiny letters?!?! I’m SOOOOO excited to put these awesome tooth fairy ideas to use. OK, I might be a little more excited than losing a first tooth really warrants, but at least I’m prepared!